Rather than fanatically and brilliantly reviewing EVERY film I have seen at the cinema this year, I am providing bite-sized reviews of movies I’ve experienced on various mediums: Cinema, TV, Blu Ray and Netflix et al. Here’s the FIRST WATCH films I saw in January 2015! A MOST VIOLENT YEAR is a slow, moody and shadowy thriller screaming gimme-Oscar-nods-material. It is really very good in ALL departments but dramatically I wanted more. Critic friendly but ultimately lacking a decent ending, thrills and character development. 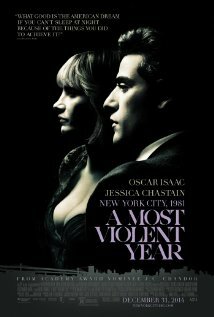 Oscar Isaac is impressive in the Michael Corleone style role and Jessica Chastain is terrific if criminally underused. Surprisingly, given the title there isn’t much violence either. BIRDMAN is an intellectual and artsy dark comedy about loads of stuff involving: celebrity, identity, artistic credibility, insanity, family, f*cked up egos, vanity as well as analysing the creative process. It is NOT a superhero film but a satire on that kind of thing. I liked the stylistic device of making it look like it was shot in one take; Edward Norton taking the piss out of ‘the method’ and Michael Keaton playing himself kind of. Smart, funny and a bit up its own arse – great stuff! Missed this great drama first time around with Matthew McConaughey as the Rodeo Electrician struck down with AIDS. Great story brought to you by a committed cast who deservedly won Oscars for their sterling performances. What I loved most in the adept screenplay was the fact Ron Woodroof essentially found a niche market within the capitalist paradigm and challenged the status quo of the corrupt government and pharmaceutical cartels. At the same time his character transformed into a globe-trotting upwardly mobile corporate executive – with AIDS! A powerful and haunting tragedy with incredibly subtle direction, this complex psychological thriller which shines a light on billionaire John DuPont and his fascination with fraternal Olympic wrestlers Mark and Dave Schultz. Steve Carell and Mark Ruffalo are great but the film belongs to Channing Tatum; a raging bull of an ordinary Joe desperately trying to find an identity amidst the two surrogate fathers he finds himself trapped between. Awesome B-movie action-comedy starring Dan Stevens as a Gulf War veteran hiding a secret past. Director Adam Wingard lays on the 80s parodic charm without veering into ultra-corn while the film contains a cool star-turn from Downton Abbey’s buffed and shiny Dan Stevens. Morally ambiguous character piece which finds Sam Rockwell’s underdog gardener befriending a precocious schoolgirl portrayed by Mischa Barton. Apparently it’s inspired by the folktale of Baba Yaga but I felt we were in David Lynch territory with the offbeat characters, sexual subtext, sudden violence and dreamlike denouement. Rockwell as usual is fantastic as an ordinary Joe caught in the crossfire of the mores of a rich and spoilt American community. Excellent true drama concerning the controversial Malcolm X played with formidable presence by the ever-excellent Denzil Washington. Spike Lee treats this political iconoclast with the respect he deserves as the one-time hoodlum is propelled to spokesperson for the Nation of Islam. It’s a modern epic and Lee imbues the film with some impressive stylistic flourishes, excellent drama and inspirational speeches. Average actioner with Arnie’s FB-CIA-GENERIC-SWAT team colleagues dropping quicker than the Austrian Oak’s box-office takings as they get wiped out one-by-one by a rat in their dirty pack. Agatha Christie on steroids with some chunky action and decent violence yet let down by paper-thin characters and weak plotting. Ultra-low budget horror comedy that I watched at the Horror-on-the-Sea Festival had terrible acting, but loads of gore and violence and cannibalistic religious nuts in the Deep South (where else) of the United States. Some fine lo-budget blood-letting and gallows humour made it great fun and highly entertaining. Jack O’Connell and Ben Mendelsohn are on cracking form as father and son banged up together in this brutal slice of prison life. O’Connell is out of control and starred-up (promoted) to the big boy’s institution as scene after scene illustrates his anger at the world; only beginning to see another way through Rupert Friend’s calming voluntary social worker. I concur with all of the praise the film WHIPLASH has been getting. It’s a triumph in all departments from director, cast and crew. Echoes of Officer and a Gentlemen (1992) and Full Metal Jacket (1987)with the fearsome Drill Sergeant battering the young grunts for starters. But then it takes off into an incredible final act as Teller’s recruit and Simmons brutal teacher face-off to an amazing musical crescendo. Miles Teller is great but if J.K. Simmons doesn’t win every Best Supporting Actor award this year I’ll eat my high-hat…. b’dum-dum-chh!! In between doing a back-to-back binge on the U.S. OFFICE (up to Season 4 so far) with Carell and the gang, I also rewatched the bastardized adaptation of LORD OF THE FLIES (1990) and Brian DePalma’s lurid Hitchcockian-slasher-giallo-homage DRESSED TO KILL (1980) with Michael Caine in a very against-type role.